For many of us, winter is synonymous with shoveling snow. It’s one of those chores that seems to come at the most inconvenient times, and you want to get it over with as quickly as possible. But shoveling is an extremely strenuous, labor-intensive task, and should not be taken lightly. The combination of sudden exertion and cold temperatures — which can increase your heart rate and blood pressure while constricting your arteries — can put hazardous stress on your heart and your muscular-skeletal system. According to the National Safety Council, nationwide, snow shoveling is responsible for thousands of injuries and as many as 100 deaths each year. 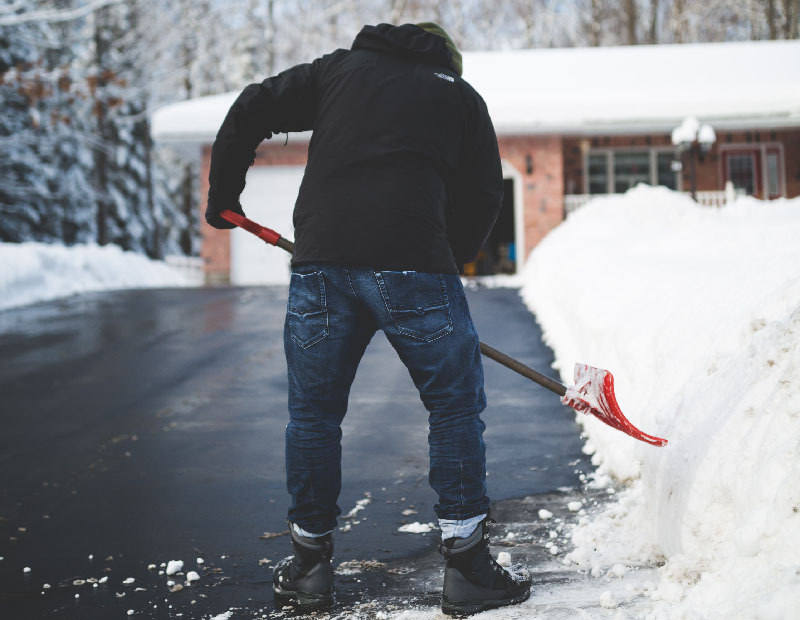 The most common shoveling-related injuries are to the lower back. And, while cardiac-related injuries account for only 7 percent of all injuries, they result in the most fatalities. With some preparation and caution, however, you can approach this job safely. Keep in mind, shoveling early and often will keep the snow from piling up and getting too heavy and will allow your body to rest between shorter shoveling sessions. When in doubt about your fitness for shoveling, check with your doctor first. Dress appropriately – Layering your clothing is the best way to keep yourself warm in the cold. Don’t forget your hat, gloves, and insulated, waterproof boots. Warm up – Stretch out arms and legs. Give your muscles 5-10 minutes of exercise before heading outside. Create safe conditions — Use ice melt, salt, or sand to make surfaces less slippery and make the job of snow and ice removal easier. Choose your shovel wisely — A shovel that is too short for you will cause you to bend more to lift the load. A shovel that’s too long makes the weight at the end heavier. Plastic shovels are lighter than metal. A smaller shovel will prevent you from picking up a load that is too heavy for you. Do not shovel after eating or while smoking. Keep a low stance, with feet apart to ease stress on your back. Shovel small loads to avoid strain. Lift snow upwards with your legs, not your back. Keep your shovel close to your body. Point your feet in the direction you want to throw the snow to avoid twisting your body and your back. Push snow instead of picking up the shovel and throwing it, whenever possible. Take frequent breaks. Stand up straight and walk around periodically to extend the lower back. For more wintertime safety recommendations and resources contact our safety specialists at info@tss-safety.com. We look forward to assisting you!